Engine Pulley Kits are a great way to dress up your engine bay. 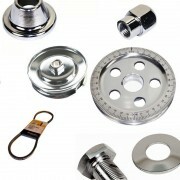 Crank Pulley Kits There are 3 products. EMPI Pulley Kit Black 7" EMPI Pulley Kit Black 7"
EMPI Pulley Kit Red 7" EMPI Pulley Kit Red 7"
EMPI Pulley Kit Blue 7" EMPI Pulley Kit Blue 7"